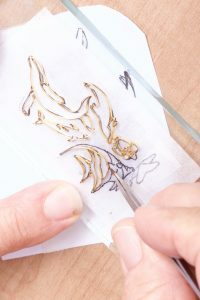 Cloisonne (pronounced cloy-zon-ay, French for ”partition”) is an ancient metalwork technique that makes use of small, precious metal filaments and colorful glass enamels to create brilliant artwork. 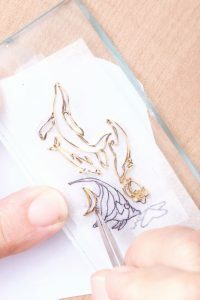 The metal wires are bent into shapes to create small cells, (partitions) of designs, and many coats of finely ground glass enamel are fired into them until one unique piece of art is rendered. 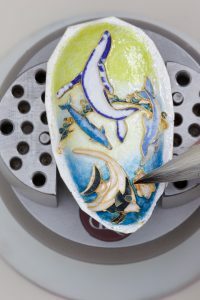 Cloisonne is most commonly used in jewelry making, though illustrations of the craft can be found in many facets of the art world, including the production of hand-made dishes, vases and abstract pottery. 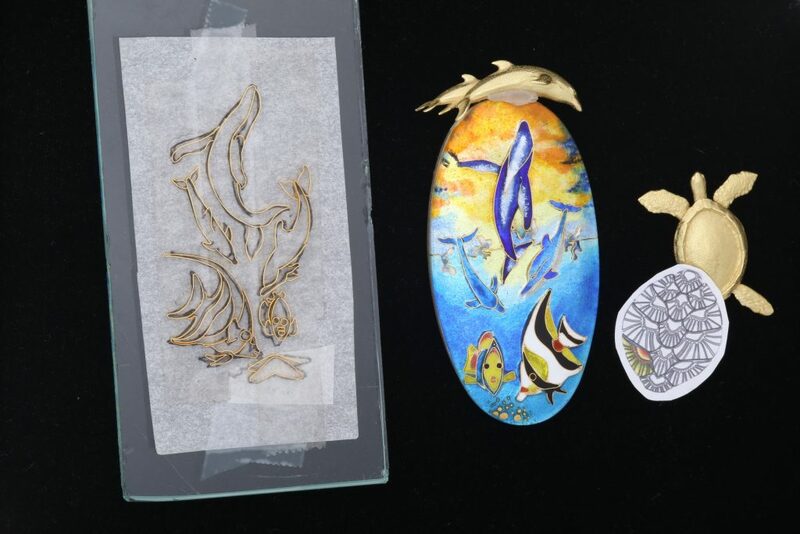 mosaics, inside Saint Mark’s Basilica in Venice, and in prized Russian Czarist jewelry. 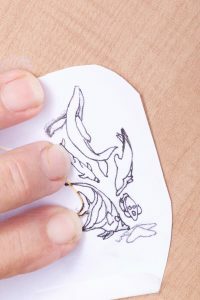 Custom designs are often painted on paper with watercolors prior to beginning the process in order to estimate the appearance of the final product. 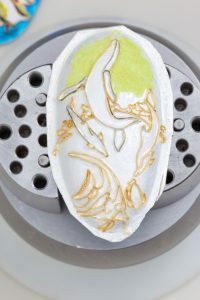 After the original artwork is decided upon, the metal ribbon like strands of 24 karat gold wire are individually bent, twisted and oftentimes soldered together to produce a blueprint for where the colored enamels will later be painted. 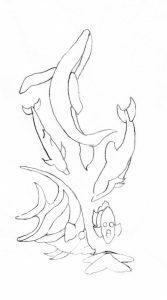 And this drawing is used to make the intricate design. Many hours are spent to bend these tiny wires, only .005 ” in thickness and .040 tall. These wires are made of 24k gold. 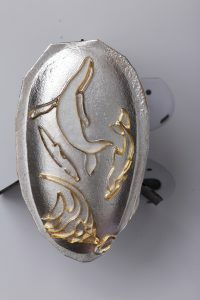 This design is attached to a base of pure silver by firing it with a clear coat of glass enamel in a kiln. 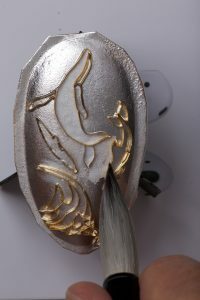 The pendant is fired again and again after each consecutive enamel layer. 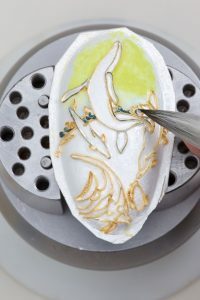 This is a painstakingly delicate practice, but the layering and firing of each coat of glass/enamel is critical in achieving a deep, vibrant color scheme for the design. 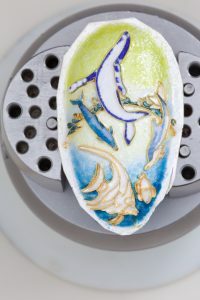 As many as 25 layers of enamel can be added to a single piece of Cloisonné jewelry. 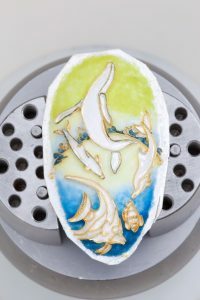 When the artist is satisfied with the colors and the cells are full the jewel is sanded and polished and placed in a custom-made, 18-karat gold setting. 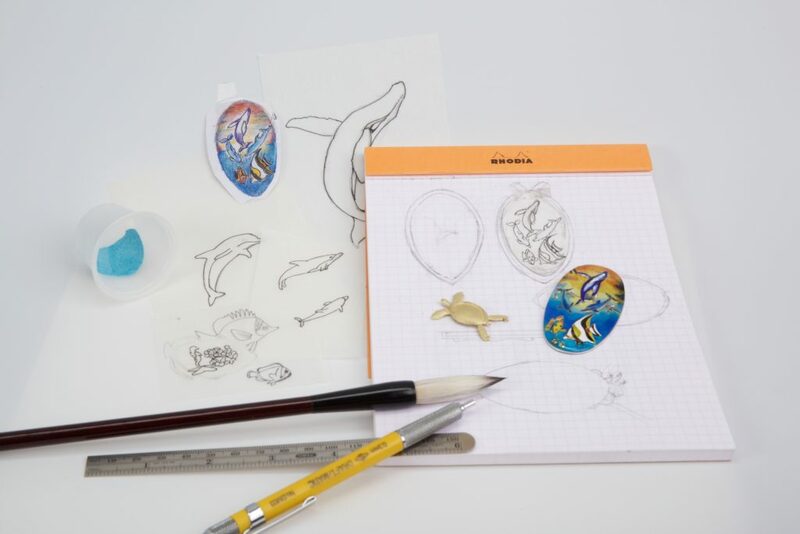 Each Cloisonné jewel takes multiple weeks of dedicated attention to complete, but the finished product is guaranteed to be worth the wait. 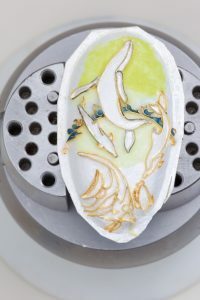 Happy Enameling!